As part of the 2015 POPSUGAR Insights Food study, we surveyed female visitors to POPSUGAR to better understand their grocery-shopping behaviors. We found that individually, 26% of women typically shop at a grocery store, 15% of women shop at a smaller market (such as Trader Joe's), 3% shop at a mass/big-box retailer and 2% shop at a club store. 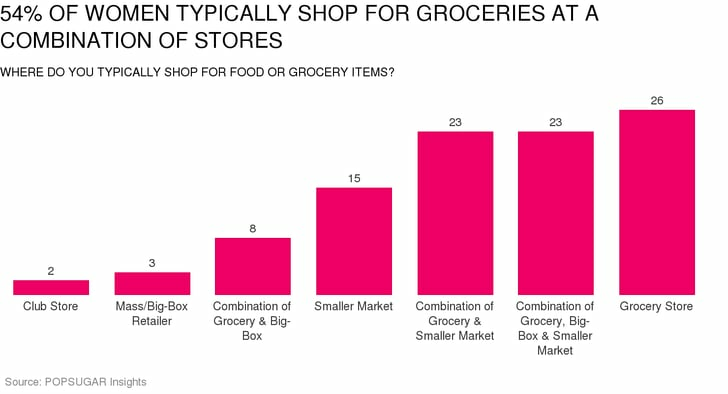 However, as one might expect given the importance of price and convenience for the modern shopper, the majority (54%) of women shop for groceries at a combination of different types of stores, with the most popular combinations being grocery, big-box and smaller market (23%), or a combination of grocery and smaller market (23%), and a combination of grocery and big-box (8%).